BIIThis chart shows the % of users in each category who have used LinkedIn. LinkedIn is perhaps the most overlooked social network. But overall it is actually more popular than Twitter, generally considered the number two social network in the U.S. The latest data shows a higher proportion of U.S. adults on the internet (22%) have used LinkedIn, compared to the percentage who have used Twitter. LinkedIn is a valuable platform for brands interested in its highly educated, relatively mature, professional audience. In a new report from BI Intelligence, we unpack data from over a dozen sources to understand how social media demographics are still shifting. LinkedIn is actually more popular than Twitter among U.S. adults. 22% of internet users 18 and older have used it, compared to the 19% who have used Twitter. 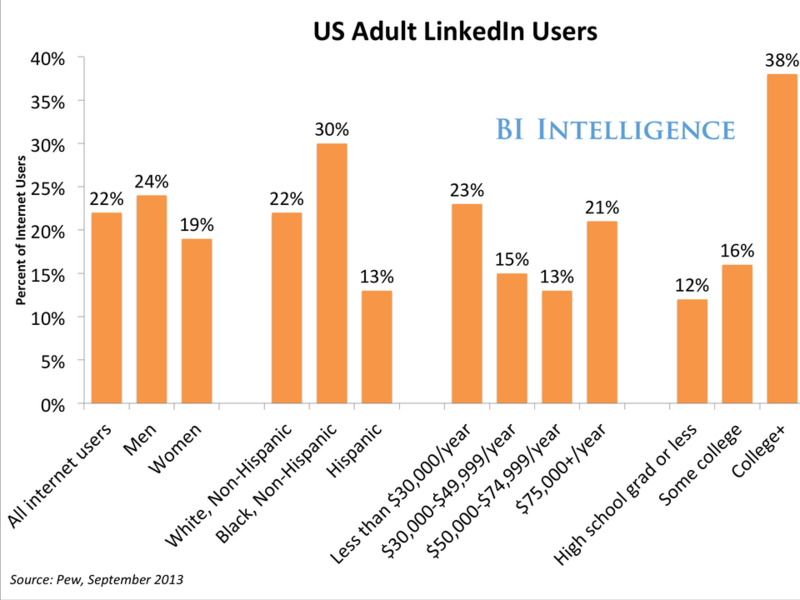 Unsurprisingly for a job-oriented social network, LinkedIn’s most notable demographic skew is based on education. Thirty-eight per cent of college-educated adult web users are on LinkedIn, compared to only 16% of those with some college education. The social network’s sweet spot is among 30- to 49-year-olds — old enough to have their careers on track — with 27% of U.S. internet users in this age bracket using LinkedIn. In general, LinkedIn has an older user base. LinkedIn is also the only top social network to feature higher penetration rates in the 50-to-64 age bracket than in the 18-to-29 age group. LinkedIn skews toward men, it’s used by 24% of male internet users versus 19% of female internet users. The report is full of charts (over 20 charts) and data that can be downloaded and put to use. For full access to all BI Intelligence reports, briefs, and downloadable charts on the digital media industry, sign up for a free trial.